If you are an LM_Net subscriber, you've probably seen a lot of questions about middle and high school reading incentive programs. Middle and high school can be a tough crowd when it comes to reading incentives. I've tried Reading Bingo at the middle school level with some success, but nothing I've tried was as successful as the my district's Lone Star Reading Celebration. Today, I am going to share what we did for the Lone Star Celebration, as well as some ideas I haven't tried yet. These ideas could be adapted to any reading list. This reading incentive plan is very generic and can be adapted to any state, district, or school reading list. It will work for any age of readers as well, provided you want to put together a "Celebration Day" at the end of the school year. Before I became an international librarian in 2014, I was a Texas school librarian for 10 years. 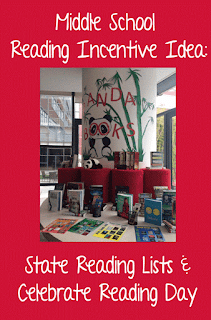 My district used the Texas Lone Star Reading List, and as an international librarian, we use the Panda Book List. 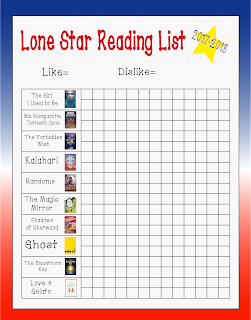 I'm going to refer to the Lone Star list often in this post, but please remember that this idea could be adapted to any reading list. As background for those outside of Texas, the Texas Lone Star Reading List is a list of 20 recently-released titles selected by a committee of librarians for students in grades 6-8. The list is always fantastic, and I have been introduced to so many great books because of the Lone Star list. Students wanting to participate in our optional reading incentive program needed to read any 12 of the 20 titles on the list. Each of our five middle school librarians made up 10-question reading quizzes for the students, and students were required to get at least 8 questions of the 10 correct in order for the book to count toward the 12 books. To keep the quiz-writing to a minimum, our district middle school librarians divided the quizzes among ourselves and then shared all the quizzes among schools. Five middle school librarians would have to write only four quizzes each. Students who read 12 books and passed the 12 quizzes got invited to attend our district's "Lone Star Reading Celebration." We did different things each year, and we intentionally planned the Celebration to last the entire school day. Sometimes, the district middle schools did the same things, and sometimes we each did our own thing. Author visit--If you are pinched for time or cash, try Skyping with an author. Extra special is if you can book an author on your reading list! If you do this, it would be nice to give each student the author's book and give them time for a book-signing session. Author Kate Messner has compiled an extensive list of authors who will Skype for free with schools and book clubs. This is a huge list, but please note that the list is dated in 2009. There is also this list from Texas high school librarian Naomi Bates and this one from Penguin Books, both of which are much more recent. Storyteller visit--I did this mainly in elementary, with our Reading Bingo program (hugely successful in elementary!). I've had storytellers who were magicians, musicians, and puppeteers. I love storytellers who come in costume and bring props! Catered lunch--I've taken students out to the restaurant, and I have had the caterers serve the lunch in the library. Even if you aren't into a caterer, you can never go wrong with pizza and cookies! Trip to local pizza buffet and arcade--This was a really popular choice, and we did it for several years. Craft activity--I bought blank drawstring bags we could draw/paint on from Oriental Trading. We used fabric markers, but I think Sharpies might work as well. Tie-dye t-shirts--These are always a huge hit! Students can also bring their own white items (not limited to t-shirts), but I provided one white t-shirt for each student. Don't forget to get several sizes for your students to choose from. I've used this tie-dye kit from Amazon, and we were able to do at least 25 shirts with it. Tie-dye pillowcases are also an inexpensive craft idea. If you can't afford to buy t-shirts for every student, pillowcases are a cheaper alternative that you can often buy in large packs (try this pack of 12 on Amazon). Everyone has a pillow that needs a case! Plants--One year, I had students use Sharpies to design their own white flower pots like these. We added some potting soil and a "mystery" plant. The theme of this activity was "Let your love for reading grow." Our mystery plant was mixed wildflower seeds I bought at Home Depot. If you do a mystery plant, don't forget to give the students directions for watering frequency and sun exposure. Jeopardy or other trivia game--I used a Jeopardy PowerPoint template to write easy, medium, and difficult questions based on the Lone Star books. Kahoot is also a fantastic (free!) option. I also had prizes ranging from small dollar store prizes to new autographed ARCs I had picked up at the yearly TLA Conference. The team with the most points selected their prizes first, but I made sure I had more than enough prizes for everyone. Battle of the Books--This is a district or region-wide effort where students "battle" to see which team knows their list books the best. My current school participates in the Battle of the Books Event in Shanghai. 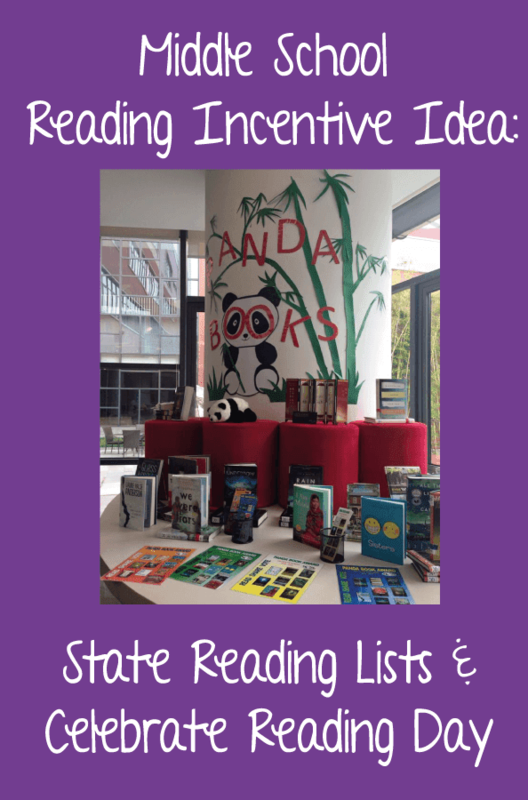 Our 15-book reading list consists of some of the current Panda Reading List titles, plus a few other titles selected by the participating librarians. Cake decorating--This is a very popular activity at our Shanghai Battle of the Books. With their BB teams, the students decide beforehand how they want to decorate their cakes. They bring their own decorating materials such as: marshmallows, M&Ms, Skittles, chocolate chips, frosting, food coloring, etc. We provide the plain cakes (single-layer 9" round cakes, vanilla) and give the teams 30 minutes to decorate their cakes and write a short explanation about why they chose that book and why they chose to decorate the cake as they did. And of course, we all get to eat the cakes when they are done! No matter what we do to celebrate reading, our participating librarians go "all out" to make sure the day is memorable for all our readers each year. Also, if you worry that there aren't many participants at first, keep promoting the program the next year. I only had 9 students who read 12 books in my first year of the Lone Star Celebration. The next year, it went up to 19. Then to 27. I'll admit that 27 students isn't very many participants out of 850 in the school, but remember, the 27 students had completed 12 books and got 80% or higher on the corresponding reading quizzes between August and May. 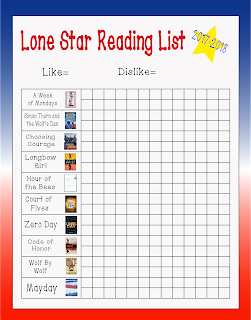 Countless other students had read at least one or two Lone Stars because I had promoted it so heavily all year long. Print the posters for the reading list of your choice. For best results, use a poster printer or printing store like Kinko's or Office Depot. These posters are designed for 11" X 18", so a 22" X 28" poster will work well. Hang the posters in a high-traffic area, preferably near your reading list display or shelf, so they can be seen easily. Choose two stickers to represent student "like" and "dislike" votes. The stickers should contrast well so they stand out from far away. I used 3/4" bright green circles and 3/4" bright orange circles similar to these. You should be able to find these stickers at dollar stores. Keep the stickers at your desk. When students tell you they read a book, they can get the "like" or "dislike" sticker from you and put it on the poster. This is also a great opportunity to talk to the students about what they liked or disliked about the books! To vote on the posters, I do not require students to take a quiz or otherwise prove they read the books. The poster is purely on the honor system. I do not do anything to influence the votes. If a book gets lots of "dislikes," that's okay. Not every book appeals to everyone, and allowing students to be honest makes the voting system authentic. This poster is great! Students looking for their next read have a quick visual reference of recommended "likes" and "dislikes" from their fellow students. Download both the 2016-2017 and 2017-2018 posters and tracking sheet set. Download the 2017-2018 Bluebonnet poster and tracking sheet set. 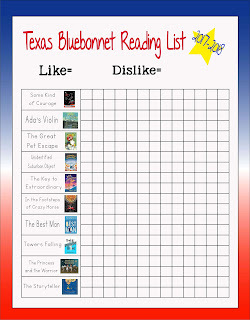 This is an sample poster of the 2017-2018 Texas Lone Star Reading List poster. The Bluebonnet poster is the same, except with 2017-18 Bluebonnet titles. Please note that my posters are not officially sponsored by the Lone Star Reading List or Bluebonnet committees. This is just something I used in Texas for several years and think others might enjoy using in their libraries. How does your school celebrate reading? What activities are popular with your students? Love this! We have the Volunteer State Book Award in TN and I'd like to do this for next year. Question: How many copies of each of the 20 books did you purchase for circulation? I'd like to have enough so students aren't waiting around to read books from the list, but I don't know how many "enough" is. Hi, Amanda, great question! I start with 2-4 of each book, depending on if I think it will be popular. If some books really take off, I will add more copies as needed. For example, Awkward by Svetlana Chmakova was on our Panda list and our Battle of the Books list this year. I gradually bought more and more of them, and we are now at 8 copies! I started with 4 because I knew it was the kind of book my students would love. I've done a variety of things over the year to promote the Lone Star books in our school. This year was a smashing success! I did a Star Wars theme in my library this year and promoted the "Jedi Academy". Students who read a minimum of 12 books from any of the 3 state lists -Bluebonnet (through 6th grade), Lone Star, and Maverick (graphic novels) - got an invitation to the Jedi Academy which we held the Thursday before spring break. We had pizza, cookies, and soft drinks, made pool noodle light sabers, and the real attraction - LASER TAG! The kids had a BLAST and I know several of those who participated were not big readers. So, even though I had only about 24 kids participate (over 30 qualified) I count it as a huge success. Definitely doing something similar next year!